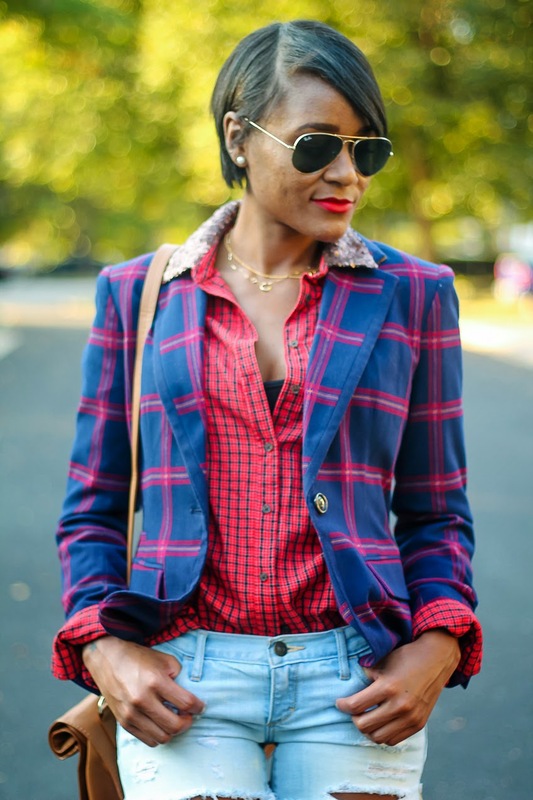 Plaid prints and embellished sequined collar. Anytime I am looking to add a little embellishment to a look, I go for something subtle, nothing over the top yet noticeable. The sequin details on the collar adds the right amount of sparkle to an otherwise tailored navy and red look. I love that the sequins complements the blazer and top but doesn't distract from the entire look. Nothing like a little shimmer to complete your look. Also, a great piece to wear during the holiday season, since it is now that time of the year! *Compensation was provided by Target via Glam Media. The opinions expressed herein are those of the author and are not indicative of the opinions or positions of Target. gorgeous jacket, and I'm loving that clutch - I wish zara still had it! amazing outfit. Love that jacket. Such a cool cool look sweety. Great look and in love with that jacket. Wonderful Boots for Women !!! you rocked this look out! very edgy! Nice Western Dresses for Girls !! Looking awesome dear..try some designer Indian wear it will also suits you !!! Love this latest tops for girls !!! Wow...wonderful Suede Shoes ...loved it !! Nicedesigner footwear, love to wear it.